The Maker_Space at AK Bell Library is an exciting resource which makes a number of creative technologies easily accessible for anyone wanting to experiment and/or develop using these technologies as part of their creative practice and business. A creative zone where you can bring your ideas to life. 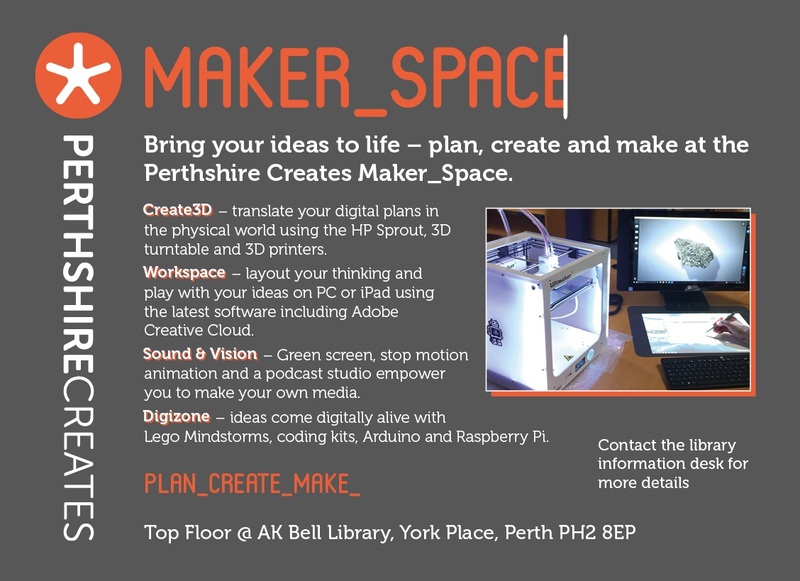 The Maker_Space is open to Culture Perth & Kinross Library members (free to join) following a brief introduction to the equipment available. It has been developed to encourage and support creatives in the area, new business start-ups and anyone with an interest in getting to know and use the developing creative technology as part of their practice. It provides hands-on opportunities to use 3D printing, 3D scanning, the Adobe Creative Cloud, a green screen and so much more. The Maker_Space is a creative zone which encourages users to explore their own interests in their own time, however, to help get you started we run a variety of ‘How to’ & ‘Hands On’ sessions, forthcoming events are detailed lower down on this page. Step 1: If not already a CPK Library Member, it’s easy to get membership either in person at any Perth & Kinross Library, or you can join online via the Join the Library section of the Culture Perth & Kinross website. Step 2: Book yourself an ‘Introduction Session’ to the Maker_Space to come and see just what is available and have your Library Membership upgraded to include access to the Maker_Space. Step 3: Book yourself some time whenever you require access to specific Maker_Space equipment. This can be done via the CPK Libraries App or the Culture Perth & Kinross website, via the OPAC terminals in the library or at the main library desk. The majority of the equipment is free to use, however, a fair usage materials pricing policy does apply if you’re using the 3D Printer or the large format printer, each job will be quoted for on request. Wide Format Plotter/Printer which can print on a variety of available media of glossy sheet and plain roll (available at cost). Other media can be used if supplied by the user. 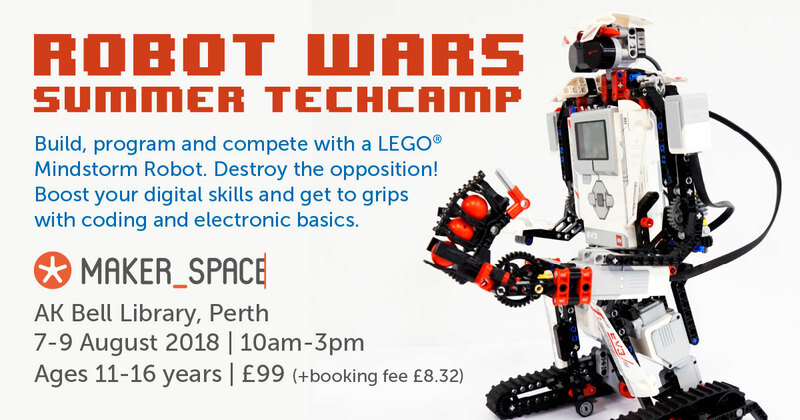 To book an Introduction Session to the Maker_Space contact 01738 444949, and if you’re happy to share your creations with us please tag @PKCreates on Twitter and @PerthshireCreates on Facebook. We run a variety of events in the Maker_Space to introduce the different technologies available, watch this space for new dates coming up in 2019, if there’s a workshop you’d like to see organised, let us know on contact@perthshirecreates.co.uk. ‘How to … be your own graphic designer using Adobe InDesign’ – Tuesday 25 September, 6-8pm, Maker_Space, AK Bell Library. This introduction to Adobe InDesign will help you understand how to start creating and publish beautiful documents for print and digital media. InDesign has everything you need to make posters, postcards, leaflets, books, digital magazines, eBooks, interactive PDF’s and much more. This session is lead by Perth based, Ian Potter from Light Press Design. Ian has worked as a graphic designer for the last 18 years and will introduce you to InDesign and give you enough information to start exploring it for yourself. However you take your pictures, be it for fun, research, product shots etc there’s always more we can do with them. Adobe Lightroom & Photoshop are two photo editing packages worth getting to grips with. Join us in the Maker_Space at AK Bell Library, Perth on Thursday 22 March (6-8pm) for a ‘How to get started … using both Adobe Lightroom & Photoshop’. Perthshire based photographic artist Cat Burton will talk through the different ways you can use both packages. Lightroom has a host of editing features and helps you organise your photos, whilst the more powerful Photoshop can be used for both everyday editing, it also has the capability of total transformations, enabling you to turn a photo into a work of art, which is exactly what Cat Burton does with her own photography. This event is designed to provide an introduction and enough of an understanding to enable you to start experimenting with these photo editing packages in your own time. 3D Printing is an exciting development in creative technology with a myriad of potential creative uses. If you’re curious about 3D printing and keen to understand the basics of how to get started in generating 3D printing, book yourself into our ‘How to get started with 3D printing’ evening on Tuesday 27 February (6-8pm), run by Iain Ross, a self-taught regular in the Maker_Space. In the spirit of sharing skills and knowledge, Iain is going to talk through how he got started, what he’s learnt about 3D printing through experimenting with various projects, the early pitfalls to avoid and share the websites and links he’s found helpful to teach himself how to print in 3D. This evening is designed to provide an introduction and enough of an understanding to enable you to start experimenting with how it works in your own time. If you weren’t able to come along to this event, these Online ‘Get to know Illustrator’ tutorials are a great resource/aid when learning how to use and get the best out of the design software. From creating logos to painting with brushes, Adobe Illustrator has a lot of very powerful tools for creating dynamic artwork/layouts. You may want to create new high-resolution artwork for printing, design a logo, create artwork for leaflets/posters/banners/adverts etc, there’s a number of ways Adobe Illustrator can be used within a creative practice and/or business. Illustrator is a vector based programme which means that unlike photoshop which is pixel based, Illustrator uses a mathematical grid to map the artwork which allows your creations to be scalable to suit uses varying from a business card to the side of a bus without losing any of the quality.